Nairn & District Gardening Club celebrated their 30th Anniversary by holding a dinner at Nairn Golf Club on Saturday 20th October 2012. Chairperson Helen Macfarlane-Grieve welcomed members, former members, representatives of local garden centres and people who have helped us over the years. She thanked them for their continued support to our Coffee Morning and Plant Sale, our Annual Outing and particularly our Annual Show. Special thanks were expressed to all the local businesses who have sponsored us each year and to Nairn Ward Discretionary Budget for their financial help for the show. Helen gave a brief history of the club from 1982 until the present day. Club member Mr Bob Moore said grace prior to everyone enjoying an excellent meal prepared and served by very helpful and pleasant staff at the Golf Club. Following coffee and anniversary cake, our speaker for the evening Mr Donald McBean from Forres, former head of Moray Parks Department gave us a very humourous talk on his 50 years in the Horticultural Industry which was very much enjoyed by all present. Our secretary gave a vote of thanks to Mr McBean and to the staff at the Nairn Golf club. The club also held a raffle at coffee time and raised approximately £240 which will be given to local charities. A most enjoyable evening was had by all. We held our Annual Show on Saturday, 11 August at Nairn Community & Arts Centre. Despite the very unseasonal weather this year, exhibitors put on a colourful display. See our Show pages for full details and results. Our Show Schdule for 2013 is now available on-line and hard copies will be available from March 2013 onwards. Keep checking our website for up-to-date information. Nairn & District Gardening Club held their 36th Annual Show this month. 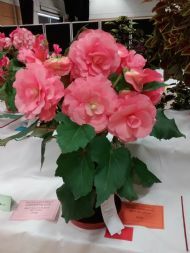 Best in Show was a magnificent pot of large headed Begonias grown by George Pirie. There were also multiple awards to Kate Fraser and Donlad Cheyne. Club Secretary, Anne Vincent, said: "A challenging growing season with extremes of weather had a limited impact on the overall number of entries this year. Our resilient gardeners still provided some exceptional exhibits for the Show benches. Full results will appear on the website shortly. Nairn & District Gardening Club has this year joined forces with another local voluntary horticultural group, Keeping Nairnshire Colourful (KNC), to safeguard the garden beds around the town traditionally filled with seasonal planting. KNC learned last summer that, as a result of budget cuts, Highland Council was going to grass over three of these beds alongside the A96 out of Nairn towards Inverness. They decided to apply for lottery funding so that they could adopt all three, turn them into perennial herbaceous beds and find three local groups to agree to plant them up and maintain them. The application was successful and when approached members of the Nairn Club agreed to adopt one. A local garden designer offered to do a planting scheme for each bed and the two local nurseries, Greens’ Nurseries and Broadley Garden Centre said they would source and supply the plants. The money was confirmed in September and plans were made for an autumn planting. However, it soon became clear that a hard winter was forecast and so the plans were put on hold. The snow and frost finally cleared and the plants were ordered for April. Members got together for a mass plant up. Shaped like a peanut the central features of the bed are a yellow column Yew and dwarf Junipers. Surrounding these are bushes of Skimmia, red Potentilla, Hebe “Red Edge” and Sarcoccoca. 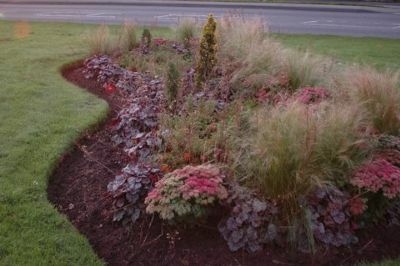 Continuing the red, green, purple & yellow theme, the bed is edged with drifts of purple-leaved Heuchera, Sedums, Stipa tenuissima & Epimediums. In the autumn members will add Tulips, dwarf narcissisi and Alliums to extend the seasonal colour. To maintain the bed, the Club has organised a rota with pairs of members checking on the plants, weeding and trimming the grass edges each month. With the warmth of April and plentiful rain this year the plants have established well and put on good growth. 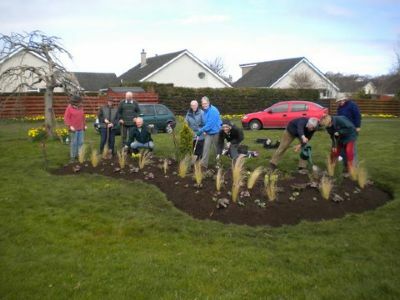 The Club has an exciting hands-on project for members and at the same time it is helping to ensure that visitors and residents alike can continue to enjoy colourful beds around Nairn.